3.1m-wide path is lined with trees. The new, natural-looking, 3cm-thick surface course of sand-coloured asphalt was precision-paved with a crown of +2.5%. 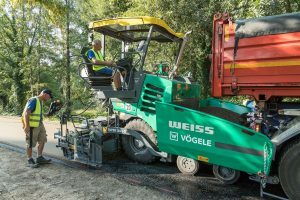 Paving coloured asphalt on the “Green Gateway” was particularly challenging, says Oliver Weiss, Site Manager and Member of the Board of Directors at Weiss GmbH Tief- und Straßenbau, a civil engineering and road construction company. This is because coloured asphalt requires high-precision paving with no room for mistakes, and because work space was extremely constricted on long sections of this tree-lined avenue. In other words, this was a perfect job for the VÖGELE SUPER 1303-3i wheeled paver. This Compact Class machine boasts very compact dimensions combined with a high performance. With a basic width of 1.85m, the SUPER 1303-3i has a total length of just 4.95m. 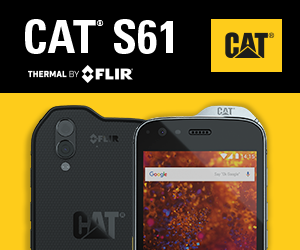 It is extremely agile, allowing easy and fast manœuvring even on confined job sites. With the Pivot Steer steering brake activated, the outside turning radius reduces to a minimum of 3.8m, which was a major advantage since six side paths and several bends also had to be paved within three job-site sections along the narrow route. Thanks to the AutoSet Basic repositioning function, this task presented no problems whatsoever. Coloured asphalt requires meticulous and highly precise paving. 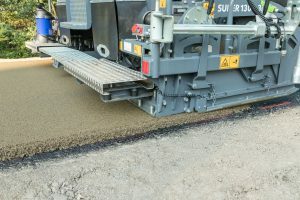 The paver’s material hopper, material handling systems and screed must be thoroughly cleaned and no residual black bitumen allowed to get into the paver from the lorry that delivers the mix. The paving crew’s footwear and shovels likewise have to be absolutely clean, or else there is a risk of black spots appearing on the sand-coloured asphalt. Oliver Weiss. If the job site is challenging, too, with narrow paths and trees, then you need real pros and world-class pavers on the job. With little space to manœuvre and narrow access roads, the material feed process became a real challenge in Baden-Baden. The lorries were not always able to dump their load because of the trees lining the road. It was extremely helpful that the compact SUPER 1303-3i has a large, 10t material hopper which supplied enough mix at all times to support continuous paving of the surface course. The VÖGELE paver’s professional material management system also contributed to assuring quality. The oscillating push-rollers ensured shock-free docking. The large conveyor tunnel, proportional control of conveyors and the powerful augers ensured an optimum flow of mix and even spreading in front of the screed. Oliver Weiss and his paving crew were thrilled with the “machine’s responsiveness”. The SUPER 1303-3i owes its outstanding steering and manœuvrability to the proven ErgoPlus 3 operating system, which is installed in all Premium Line machines from VÖGELE. Numerous convenient and automatic functions facilitate operation from both the ergonomically designed operator’s platform and the screed operator’s consoles. The crew was further impressed with the powerful drive. With a 74.4kW diesel engine, the SUPER 1303-3i could easily push the lorry in front of it. Another plus they noticed was that the machine ran very quietly, and not just in ECO mode. The AB 340 Extending Screed is the perfect screed for pavers in the Compact Class. With a basic width of 1.8m and a maximum pave width of 5m, the screed is ideal for paving combined foot and cycle paths. On this job, the SUPER 1303-3i used a screed with tamper and vibrators. To improve water run-off along the “Green Gateway”, the route was paved with a crown of +2.5%. The crown was set hydraulically at the push of a button on the screed operator’s consoles. By pressing the plus and minus buttons on a console, the operator was able to check the settings for the right and left sides of the screed on the display at any time. VÖGELE’s Premium Line SUPER 1303-3i is the machine of choice for jobs requiring high precision on narrow sections. 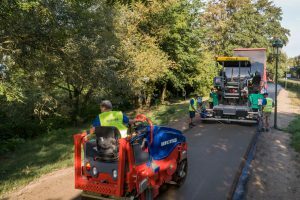 The paving crew of the long-standing company Weiss GmbH has a great deal of experience with coloured asphalt and was more than pleased with the machine’s performance and laydown rate in Baden-Baden. How did our fellow operators get on in the annual Volvo Operators Club final which was held in Belley, France, this October.